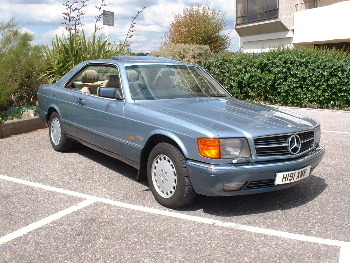 MERCEDES BENZ 500 SEC V8 1990-H 86,000miles. 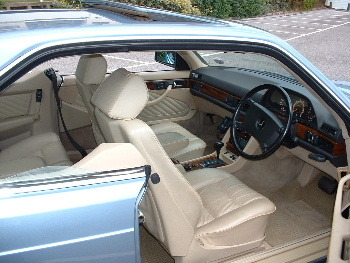 Finished in Diamond Blue Metallic with Full Beige Leather,Huge Spec Inc:Top Tint Screen,Front Fogs,Electric Windows/Tilt-Slide Roof/Mirrors/Seats/Aerial/Steering Wheel/Headrests,Rear Blind,Air-Con,Cruise Control,ABS,Power Steering,Central Locking,Traction Control,Heated Memory Seats,Front and Rear Centre Armrests and Headrests,Switchable Auto,Immobiliser,Comms Pack,Auto Seat Belt Feed,Remote Control Pioneer Headunit,Polished Zebrano Wood Trim and Cappings,Full and Total Mercedes Benz Service History. POSSIBLEY THE BEST AVAILABLE. PLEASE NO TIMEWASTERS-NO OFFERS.